DinoBoy was born with sensitive air way and eyes. thus little bit of dust in the air or things he gets in contact with will sets his eyes itching or nose starting to get choked up. We tried to minimize the irritation by limiting the number of furry soft toys he could have, he wasn't really happy with that. We even wash the ones that we approved as frequent as possible to rid the dust that got trapped onto them. We bought anti dust mites mattresses and bed sheet covers to fight off dust mites. Bed sheets, pillow and bolster cases are changed weekly and every half a year we will replace our pillows and bolsters, we would have changed our mattresses too but they are too expensive to change so frequently. All these does help ease his sniffing and sneezing but it never really get rid or prevent it 100%. We were actually thinking of getting those specialized vacuum cleaners that cost a fortune just to end his ordeal but we have been procrastinating as we weren't sure if it will really help or not thus not willing to part with that huge sum of money. Then De Hygienique contacted me a couple of weeks ago to introduce their services and hoping to do a collaboration with me on my blog. 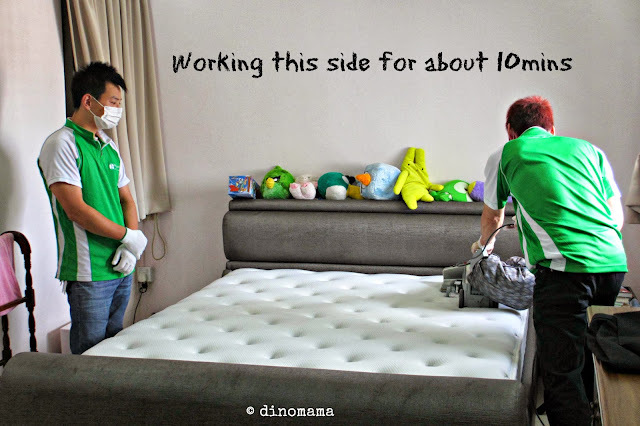 I went to their website to know more about them, I read about their mattress cleaning services that uses 100% dry cleaning process which means that if there are no moisture introduced to the mattress I do not need to worry that mould will grow on the damp area, I immediately called them up to fixed up an appointment. On the day, I received a call from Fendi Zhang, Manager of De Hygienique informing me that they will be reaching my house in 30 minutes. I took that in mind but was mentally prepared for them to be late, I mean since when delivery men, contractors, technicians etc ever arrive on time? I was caught off guard when the team pressed on my door bell 25 minutes later, it definitely leaves a very good impression on me about the team and the company. Remember the olden days when we have to move our mattresses to a sunny spot, use a stick to beat it and leave it under the sun for some time to "kill the bacteria"? Well, this industrial grade vacuum does all this but in the comfort of your house. 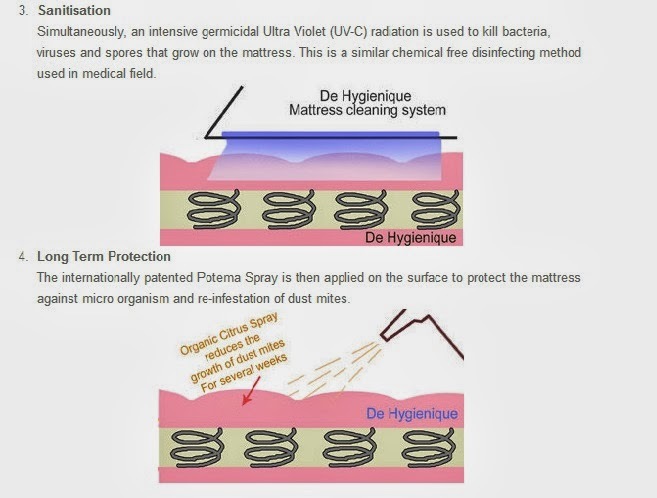 In a more commercial term, the vacuum is able to pulverise, extract dust, dirt, dust mites and other harmful micro organism from as deep as 4 inches into the mattress. The specialist will clean and sanitise both side of the mattress so if your mattress is about 8 inches high, it should be thoroughly cleaned. 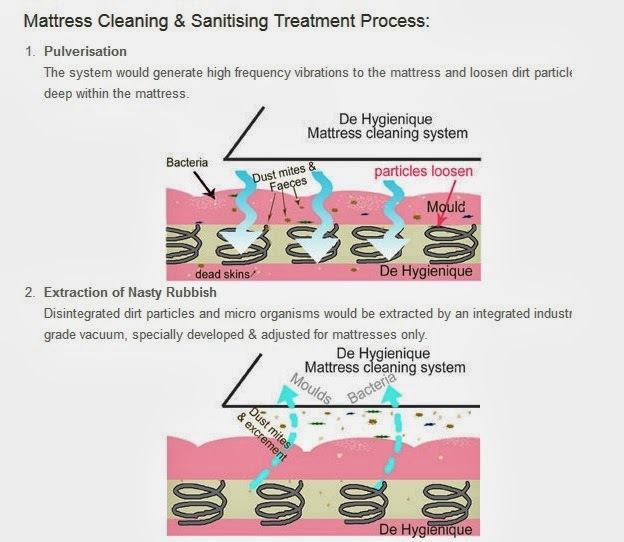 Here is a pictograph to show the De Hygienique mattress cleaning process. 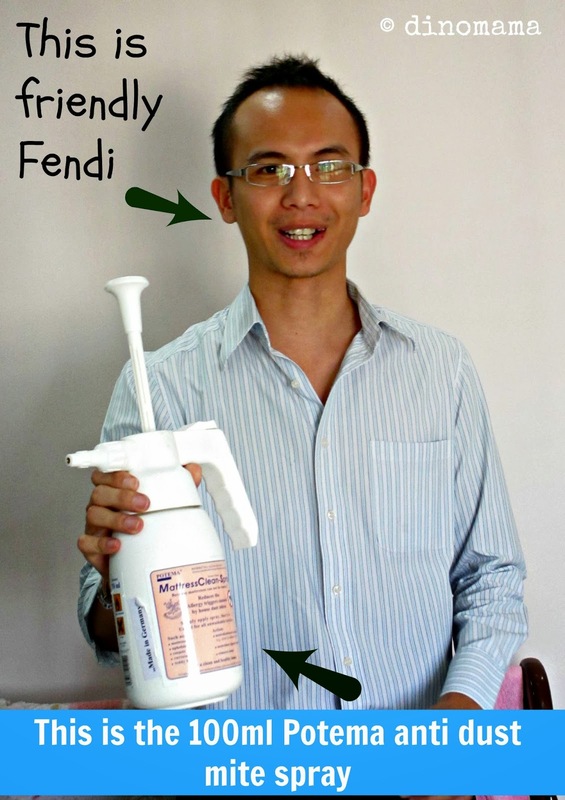 To show me what the super powerful industrial vacuum can do, Fendi did a small demonstration. Instead of attaching the HEPA filter bag onto the machine, a black cloth was tied tightly at the outlet vent. Then one of the specialist worked the machine on a small area of my 2 year old mattress for about 1 min... and this is what came out from my mattress. Scary right?? I got a shock of my life! 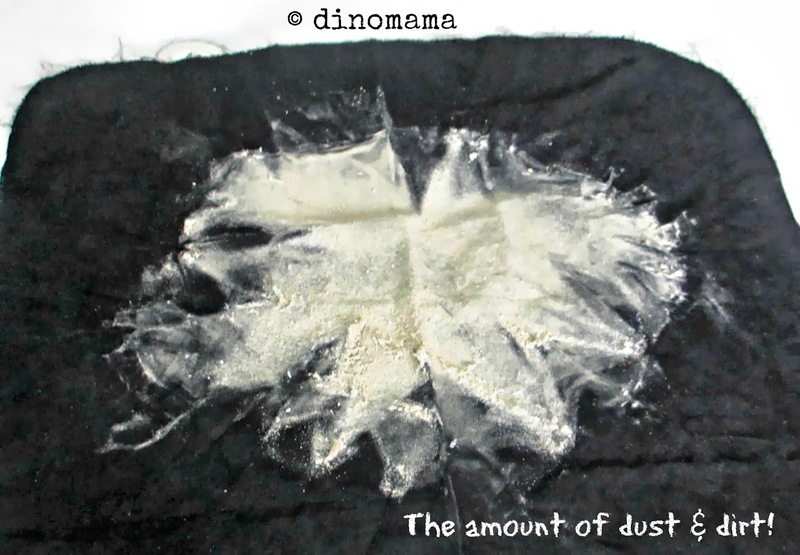 No wonder DinoBoy starts to sneeze and rub his eyes shortly after he lies down on the bed. It is such a small machine but powerful enough to do a big job! I noticed that there is a towel on the floor and was wondering the purpose of it when Fendi explained that to prevent cross contamination from the floor, they will place their vacuum on the clean towel instead of on the floor when they need to put it aside to flip the mattress over etc. Talk about being serious in their work... wow! 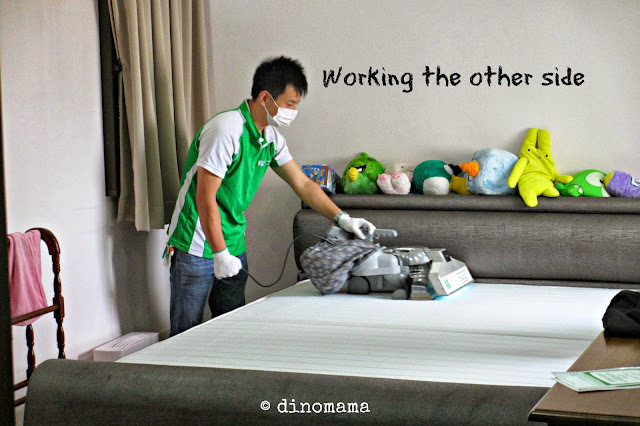 The specialist working on my Queen size mattress and took about 15mins to thoroughly clean it. 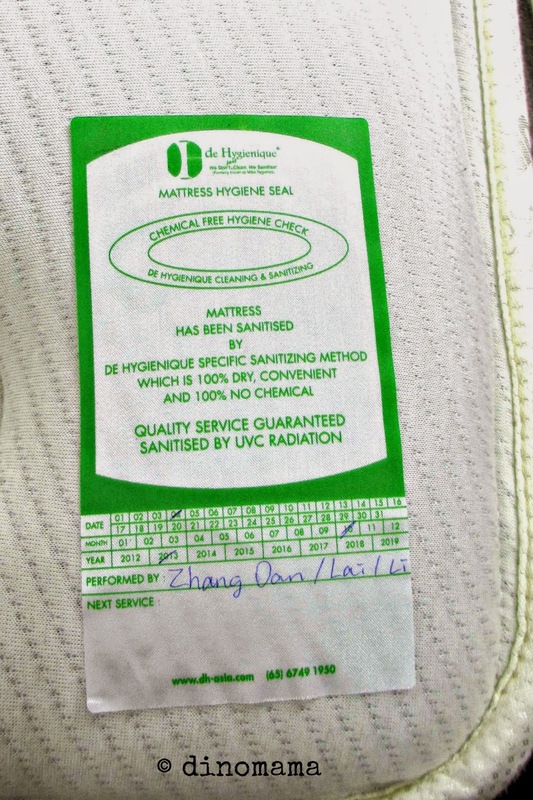 My 4 mattresses received a De Hygienique seal each with the cleaning date clearly stated on the seal. This will be useful to keep track of the mattress cleaning date and to arrange for the next cleaning date. It has been recommended to clean and sanitize a mattress twice a year to maintain an acceptable mattress hygiene standard. I appreciate Fendi's thoughtfulness by suggesting that they sanitize DinoBoy's soft toys and our pillows & bolsters with their Potema anti dust mite spray due to the severity of DinoBoy's sensitive airway issue. Every thing was done in about an hour, my rooms are filled with the nice citrus smell from the Potema anti dust mite spray. It feels so relaxing that I almost want to lay down on bed for a short snooze. The ever polite and friendly Fendi assured me that DinoBoy should be able to have a good night sleep tonight and if he still rubs nose or sneeze just give him a call, he will arrange for another cleaning again. Well, DinoBoy did sleep well that night, he was not rubbing his nose or eyes too! We will definitely be engaging their services on a regular basis! 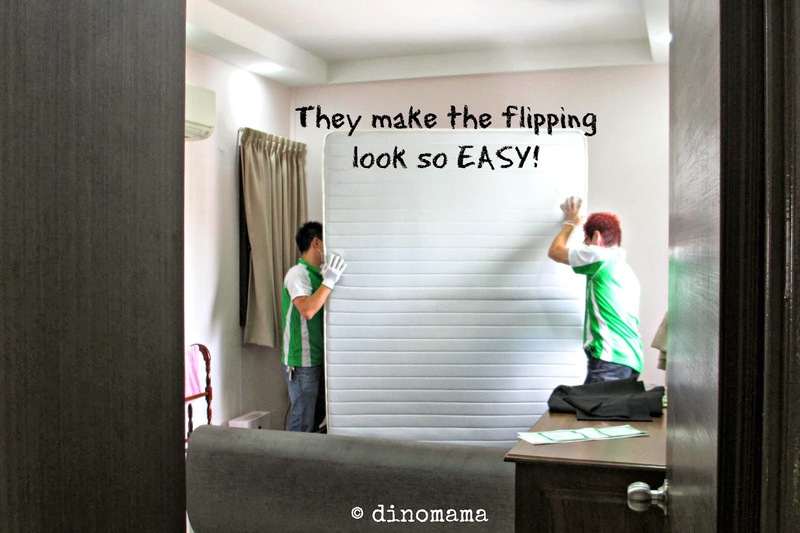 Great Deal #1 - Make an appointment with De Hygienique customer service at +65 6749 1950 before before 30 November 2013, quote DinoMama2013 and receive 10% discount on their services. Great Deal #2 - You will receive a complimentary 100ml Potema anti dust mite spray worth $15 (while stocks last!) upon confirmation of appointment. Leave the cleaning to the professionals while you sit back and relax! No more burning a hole in your pocket by purchasing an expensive vacuum cleaner. No more lugging that heavy & bulky expensive vacuum cleaner trying to clean your mattress. 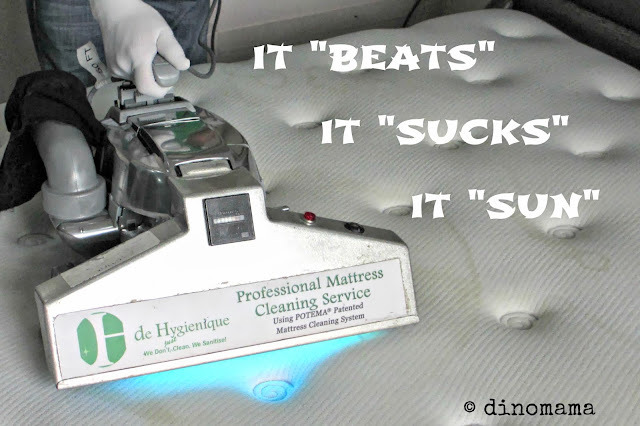 Remarks : De Hygienique (Asia) Pte Ltd provides the DinoFamily with a complimentary mattress cleaning services for the purpose of this review. All opinions & views are 100% by the DinoFamily based on our experience with their services. Very good idea t do this. I suppose if I called the guys to come to the Rocky Mountains it would take them more than 25 minutes. I didn't know my mattress is so dirty till that day! Now that I know I will make sure I get my mattresses clean every 6 months. Hi, do you know the content of the anti-dust mite spray? Kids with sensitive skin and airways may react to it, if it contains chemicals. A friend has a recent unpleasant incident with some mattress spray. Hi Elaine, thank you for your comment, I have posted your questions to De Hygienique who just replied to me today. Please refer to the link which will explain the contents of the anti dust mite spray.